You can use tags to organize cards. Each card can have multiple tags. 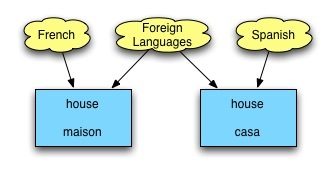 For example, in the diagram below, the card for casa is tagged with both Spanish and Foreign Languages, while the card for maison is tagged with both French and Foreign Languages. This makes tags much more flexible than the traditional folder structure to organize files on a computer, where each file can only be in one folder. In the 'Activate cards' dialog, you can select which cards you want to study based on a number of criteria, like tags and card type. You can give this subset a name for easy reference later. The system is very flexible, as a card can belong to more than one saved set. Also, if you edit a card to change its tags, its membership of the saved sets is automatically updated. You can use the New and Open options on the File menu to create new databases to store your cards. However, even if you are studying many different subjects, we recommend storing all of your cards in a single database (file) and using tags to add structure, as the saved set mechanism is much more powerful and allows e.g. cards being in more than one set.